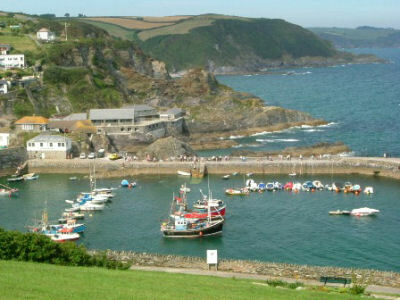 The cottage is located in the well-photographed 14th century Cornish fishing village of Mevagissey. Tucked away from passing traffic, the cottage is just a few minutes gentle walk from the picturesque working harbour and has the added benefit of its own parking space directly outside. A variety of shops, pubs and restaurants lie within a short stroll. 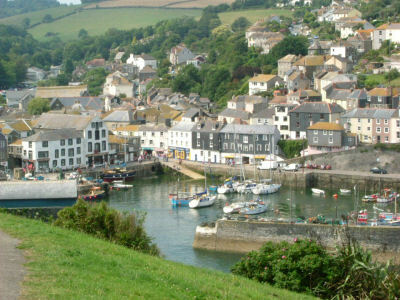 Church Street is part of old Mevagissey and situated on the Eastern side of the village providing easy access to St Austell without the need to get involved with the heavy summer traffic near the harbour. The cottage was originally a one bed-roomed three storey dwelling, rumoured to inhabited by a local artist. We understand that during the hot summers the original sash windows had to be removed to keep the house cool! The cottage was rebuilt and extended in the early 1970s to form a detached 2 bed-roomed Delabole (Cornish) slate clad house; typical of most of the cottages in the area. In 2003/4 it was updated and converted to a very high standard. The reversed accommodation makes the best use of natural light and the views over the rooftops of Mevagissey; watching the birds can be fascinating. The cottage is equipped with modern day facilities, up-to-date decor and furnishings, there are fitted carpets throughout, except in the bathroom and kitchen area which have non-slip waterproof flooring. All of the windows have either vertical or roller blinds, and should the weather be really hot when you visit, we have provided fans! On the ground floor, there is an entrance/sitting area with night storage heating, seating and a bookcase containing a selection of books and games. There are two storage cupboards; one of which contains a tumble dryer and a safe. Through the hall is a bedroom with twin beds and a larger bedroom containing a double bed. Each bedroom has a remote control TV, bedside lighting, electric heating, clothes storage, clock/radio and a hair dryer. On the first floor, there is a luxury fully tiled bathroom comprising of bath, wc, separate shower cubicle, bidet and wash hand basin, shaver point, storage cupboard and electric fan heater. A combined open plan lounge/dining/kitchen area. The lounge/dining area has seating and dining for four, widescreen TV, video, DVD, stereo. There is an electric stove effect fire and night storage heating. The kitchen area is fully fitted with modern units, housing fitted ceramic hob/oven/extractor, fridge freezer, dishwasher, washing machine and microwave. Kitchenware for 4 people, cleaning supplies, tea towels etc. Electric heating is in every room with additional night storage heating in the open ground floor and first floor areas. There is no charge for heating, all bedding and towels are also included. Please remember to bring your own beach towels. There are fitted carpets throughout, except in the bathroom and kitchen area which have non-slip waterproof flooring. There is a small patio/sitting area to the side and rear equipped with a table and chairs. There is soft outside lighting for those hot summer evenings. To the rear there is a large lockable storage shed suitable for the storage of cycles, surfboards, fishing equipment etc. The cottage has the advantage of its own private car parking for one vehicle to the front. A hose is available in the cellar, should you need to hose down your surfing/fishing equipment or if the seagulls decide to target your car! Should you require an additional car parking space, this can be rented from the local Sunny Corner car park for £4 per day, please contact them direct on 01726 844503 to book a parking space. NB. Accommodation not suitable for the infirm or children under 11 years old. No smoking.